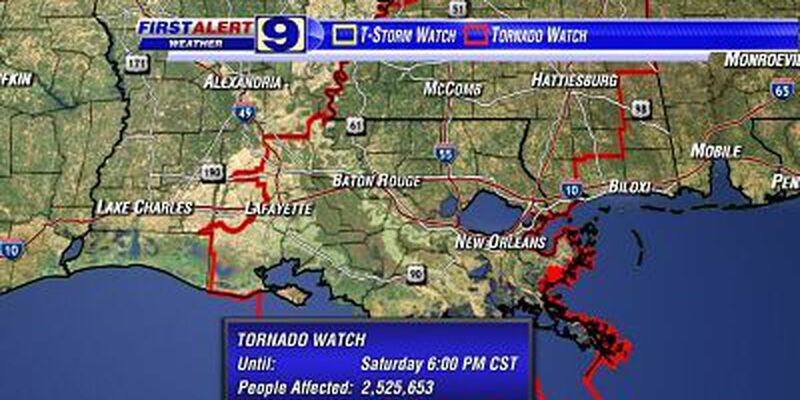 BATON ROUGE, LA (WAFB) - A Tornado Watch has been issued for the entire WAFB viewing area until 6 PM Saturday evening. Remember that a Tornado Watch means conditions are favorable for the development tornadoes. T-Storms continue to develop out ahead of an approaching cold front early this afternoon. These individual storms will move quickly to the northeast out of the Gulf of Mexico across SE Louisiana and SW Mississippi. These storms will produce heavy rain, gusty winds, and maybe a possible tornado. The primary threat with t-storm activity today continues to be strong damaging winds, but a tornado cannot be ruled out hence the issuance of a "tornado" watch. Short range weather model runs continue to show strengthening storms advancing across the area over the next few hours. This is a result of the very warm and moist conditions currently in place. South Louisiana also has a lot of untapped energy in our local atmosphere due in large part to a lack of t-storm activity early this morning. The Storm Prediction Center placed SE Louisiana under a "Slight" risk for severe weather earlier this morning. That means that a 15% chance exists of seeing severe weather (damaging winds) within a 25 mile radius of anywhere within the risk area. A 5% chance exists of seeing a tornado within a 25 mile radius of anywhere within the risk area. Stay tuned to WAFB-TV, wafb.com, our social media accounts, and our smartphone apps for further updates.